Chandigarh 27th November:- This is for the first time that a actress going to paly a double role in a Punjabi film. The actress is Neeru Bajwa. The film is 'Proper Patola' and it is just a day away from its release now. Pairing up with two faces of Neeru are Yuvraj Hans and Harish Verma. This presentation of Country Media and Speed Records has been produced by Deepak Lalwani and directed by Harish Vyas. Amit Saxena is the writer and co-director of the film. Other actors include Ashish Duggal, Anita Devgan, Harpal Singh, Neeta Mohindra, Bunny, Teji Sandhu, Harby Sangha and Master Prabhjot. Neeru along with Yuvraj, Harish and producer Deepak was here today to talk about the film. While talking with media Neeru said that it is a story of twin sisters Jeet and Preet and their lovers Yuvi and Raj. A lot of lies prevail in order to get things right. But the ultimate result is a lot of confusion and fun. Releasing this Friday, this film has masala for the whole family. Neeru further said that initially she was little reluctant playing the two characters simultaneously but her co-actors really helped her in maintaining the particular mood. She said that this project was like a roller coaster ride as I was switching my character from Preet to Jeet and vice versa all the time. It was challenging, interesting and super fun. Another special fact about this film is that Yuvraj Hans and Harish Verma will be seen for the third time together sharing screen. Prior to this they have worked together in super hit films 'Yaar Anmulle' and 'Burraaahh'. Yuvraj told that only after hearing Harish's name in the cast, he gave a nod to the project. He said that Harish is my elder brother and we never miss a chance to work together. Harish also feels that his timing with Yuvraj is god-gifted and he feels like spending a normal day even while shooting on camera. The actor believes that the real bond starts from real life and then proceeds to the reel business. The music of the film has been composed by Jassi Katyal and Saurabh Kalsi and is making waves all over. Producer Deepak Lalwani told that we did not leave any stones unturned while working on this project. No compromises were made in any department as we are looking forward to a long innings in this industry and entertaining the audiences every time we hit the floor. One Digital Entertainment is the digital partner of the film. 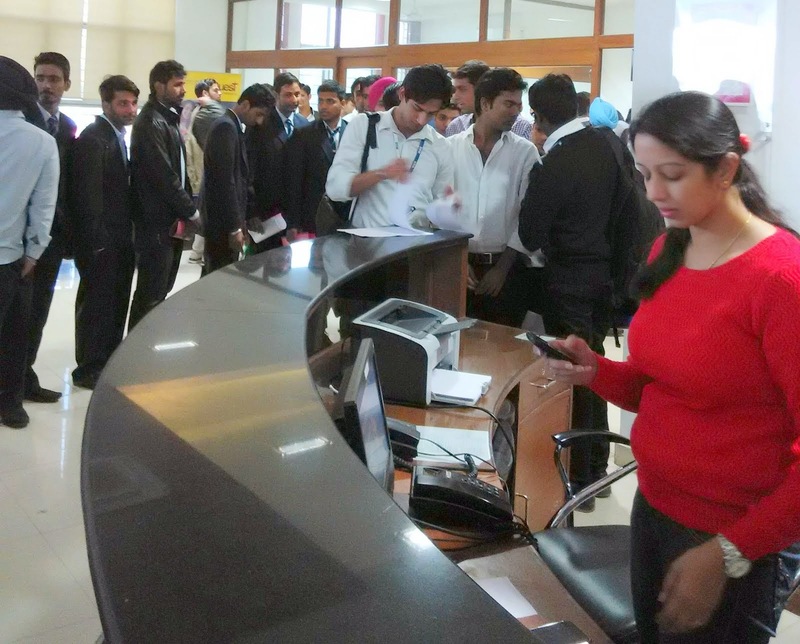 Mohali 27th November:- Quest Group of Institutions organized a placement drive for its final year students of B.Tech. Mechanical and Civil Engineering students. Cheema Boilers selected 8 students Mechanical and Civil Engineering students. The Company offers starting package is of 1.74 lac per annum. The selected students are given offer letters with joining dates immediately after completion of their final examinations. The placement drive was commenced after giving the students a detailed presentation on the company profile, their career path, selection process, and job profile and salary package. Total 25 students were shortlisted after Jam Round and written test and 11 students were finally selected after personal Interview round who will join Head Office. The selected Students will be given 40-80% hike depending on their performance after one year. Chairman D S Sekhon congratulated the students who secured job offers .He encouraged them to prepare well to succeed and enter their professional life on a winning note. Mohali 27th November:- In Glitz n Glamour Exhibition, the collection is new & the Exhibitors are new, with a new concept, with a cause... by Albasir of Kashmir, known for his brilliant Ethnic & the most beautiful karigari of Pashmina Shawls,would be showcasing & putting 5 of his Exotic shawls on Auction, of which the profits would go to Kashmir funds for Rehabilitation of Kashmir. We are also inviting & requesting the gorgeous people of Chandigarh to come up in a big way & buy the Exotic stuff presented there, in the Exhibition & donate just a wee bit for the rehabilitation of Kashmir. It can, be in the form of winter clothes as well to warm up people sitting all cold & chilled up there. Giving more detail about the show organize Rashmi Bindra said that this time we are coming up the Designer Elmour especially from Calcutta bringing in the exclusive range of Sarees & Ethnic wear specially design by the Designer. Famous Raa Designs by Manish Ahuja (Lakme fashion week designer) is coming after a long time to Chandigarh with his classy yet sheek thread embroideries mainly black & white. Amour is getting collection of hand-crafted & smart digital tunics, cushion covers & candle stands & much more. Talaash is coming all the way from Gurgaon with Ethnic blends. Mafadeny , Dressing loft , Orange candy is getting smart , casuals & formals adding glamour to the Exhibition. Local Chandigarh girl Rajni gill is coming up with exotic ethnic collection made by her. Accessories is throlled by hand bags , foot-wears , belts , phone covers , Scrafs , shades , watches & anything you can think of that will make you classy is definitely here . 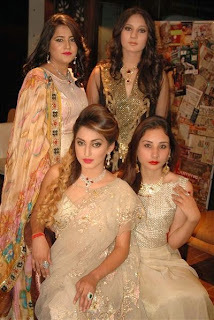 Jyoti khosla , Sanam tamanna , Dia , White lily is doing lot of customised & blingy outfits . Jewellery Jagdish jewellers is known from golden yester years for their par-excellence hand-crafted traditional, peepal patti , diamond polka & jadau jewellery. Ravoy gems is exhibiting for thr first time with us bringing exclusive range of diamond jewellery, suiting everyone's pocket & Style. Nav jewels is back again with her exotic jewellery of passas, karda's, jhumkas ,diamonds & we sure cannot miss sirjana's signature label . She further added that more Designers are likely to be participate Mrignayani Collection, Ruzhan Pakistani Concepts, Post Card By Swati & Gaurav Chandigarh, Rubaroo, Begum's, Geetika Creations, Cresent by pooja, Saisha designs, Under the name of wedding touch, Pooja's creations, Veer Riwar Designs, Odhini, D'jammies, Rays studio, Cotton club, mafadeny, Adah designer attire, Tekchand Handloom House, kaseedakari. Semi- precious stones and many more like Elegance jewels by alka , Anjul a-line. Mohali 27th November:- Illegal road side encroachments which results in mishap, will not be acceptable. This was stated by Deputy Commissioner Tejinder Pal Singh Sidhu while presiding over a District level road committee meeting at Municipal Corporation meeting hall. Tejinder Pal Singh Sidhu directed the executive officers of PWD and Mandi Board to conduct a special visit of roads falling within their Jurisdiction and to submit a report after removing illegal road side encroachments. He further said that a close watch will be kept on these locations so as to prevent illegal encroachments. During this Deputy Commissioner Directed the all Executive Engineers to prepare detail estimate report for link roads and in this regard, he also directed to submit the report along with funds requirement within 7 days, so that renovation of village roads could be done priority basis. During this, Tejinder Pal Singh Sidhu also directed the officer to ensure that the name of district to be written as "Sahibjada Ajit Singh Nagar" instead of "Ajitgarh". During this, while reviewing the development works of the district, Tejinder Pal Singh Sidhu directed the executing officer to prepare a detailed action plan from Jan-2015 to Dec-2015. The action plan report must contain the detail of the expenditure for the development works and requisite report should be submitted by 15, December. Tejinder Pal Singh Sidhu added that the project reports must reflect the benefits of general public. He said that completion of development works must be ensured timely without any lapses. Tejinder Pal Singh Sidhu further said that the Swach Bharat Abhiyan initiated by Prime Minister Narinder Modi, will be continued in future and cleaning works under the campaign will be done on first priority. Social working societies and youth clubs must be contacted for the same. 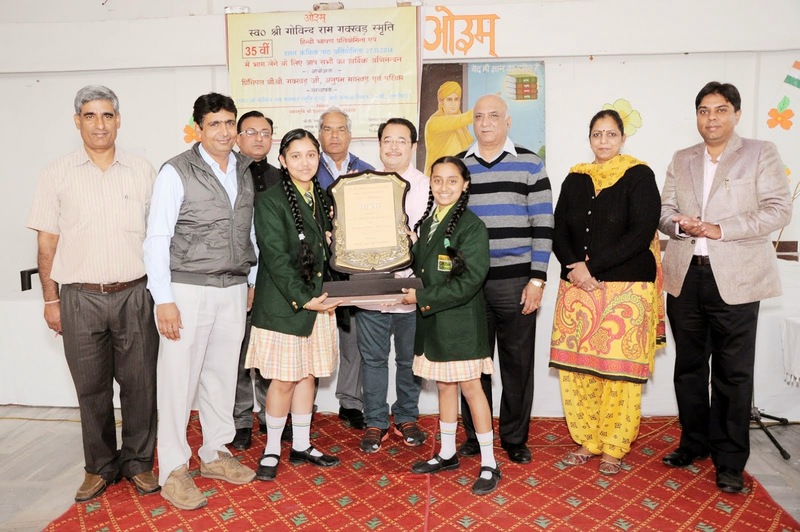 Chandigarh 27th November:- A Hindi Declamation contest and 'Hasya Path Pratiyogita' was organized by Late Shri Gobind Gakkhar Smriti Trust in Arya Samaj Sector 7-B, Chandigarh today. Students from Punjab, Himachal Pradesh, Chandigarh and Haryana participated in these competitions. In Hasya Path Kavita Pratiyogita-Tanisha, Vikas, and Madhav bagged first, second and third prizes respectively while Yashesh and Kumar Sambhav got consolation prizes. Kiranjit and Tanishka got trophy for his best performance. In Hindi Declamation contest- Arjun Goyal, Jainiphar and Vanshika got first, second and third position respectively while Diksha and Simranjot received consolation prizes. Garima and Vanshika got trophy. Chandigarh 27th November:- Students of National Institute of Nursing Education , PGI, Chandigarh organised health mela on 'Child Care' at village Dadu Majra & Dhanas, under the guidance of Dr. [Mrs.] Sushma Saini and Mrs. Kavita, lecturer, Mrs. Manjula Thakur and Mr. Suresh Kumar, Clinical Instructor, and Ms Ravneet Kaur, PHN, NINE, PGIMER. The event was inaugurated by Dr. [Mrs.] Sandhya Ghai , Principal , NINE, PGIMER. She appreciated the efforts made by students in educating the parents regarding Child Care. 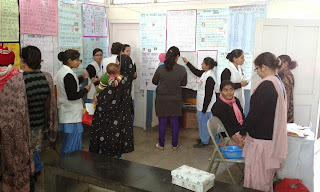 More than 100 people visited health mela each at Dhanas and Daddu Majra village, Chandigarh. 170 children were registered for their anthropometric examination. Parents of children were educated about different aspects of child care viz: neonatal care, healthy breast feeding practices as well as prevention and management of malnutrition, diarrhoea, seizures, and other childhood disorders. Along with education, people were also demonstrated about home made Oral Rehydration solution, preparation of complimentary foods for infants at 6 months age, hand-washing practices. The children were given bananas. People expressed that they gained lot of knowledge and found it beneficial. Chandigarh 27th November:-The Municipal Corporation, Chandigarh today signed a memorandum of understanding with Bhabha Atomic Research Centre, Mumbai for setting up of two Nisargruna Bio Gas Plants based on biodegradable waste at Chandigarh. Rajiv Gupta, Joint Commissioner and Subhash Chaudhary, Executive Engineer, Public Health Division No.2 of Municipal Corporation, Chandigarh signed the MOU on behalf of Municipal Corporation and Dr. Sharad P. Kale, Scientist signed the MOU on behalf of Bhabha Atomic Research Centre, Mumbai. The MOU was signed in the presence of H.C. Kalyan, Mayor, V.P. Singh, IAS, Commissioner and Finance & Contract Committee members of MC including Pardeep Chhabra, M.P. Kohli, Smt. Rajinder Kaur and other senior officers of MC, Chandigarh. According to the MOU the two Nisargruna Bio Gas Plants each of 5 t capacity based on biodegradable waste will be set up at Chandigarh at the cost of Rs. 20 lacs per tonne. The MOU was signed after the approval of General House of Municipal Corporation Chandigarh. The first plant will be set up at Industrial area Phase-I as a pilot project. The work will be executed by Bhabha Atomic Research Centre, Mumbai as a deposit work of Municipal Corporation, Chandigarh. The Research Centre will get the work executed from its authorized agency under their supervision and technical guidance as well as engineering wing of Municipal Corporation, Chandigarh. After setting up of the plant, the work of operation and maintenance will be taken up under the Atomic Research Centre authority for three years. The plant will get segregated kitchen/organic wet waste from hotels and bio degradable waste from vegetable market. This will lead to methane gas formation which will be further used for generating electricity. The fertilizer generated as residue will be used in horticulture. SadiyaSiddiqui and Sonali Sachdev Visit Chandigarh to Talk About Their Show Satrangi Sasural. Chandigarh 26th November:- Zee TV, channel now brings its viewers yet another story of hope, Satrangi Sasural. The show centers around Aarushi who marries Vihaan Narmada Vatsal, a man raised by not one, but seven very strong and independent mothers. Starting 3rd December, every Monday to Friday at 10 PM on Zee TV. join Aarushi on her journey of deftly managing the expectations of her seven mothers-in- law, who only have Vihaan's best interests at heart. The sensitive depiction of the unique dynamics between a bahu and her seven mothers-in-law, is the first-of-its-kind on Indian television. Visiting the town of Chandigarh to talk about their upcoming show today are the very renowned actors– Sadiya Siddiqui and Sonali Sacchdev. Talking about the show, Sadiya Siddiqui and Sonali Sacchdev said that story basically based on the Delhi based the Vastals are a unique family that represents a cross section of India's vibrant culture as each of the mothers hail from diverse backgrounds and have their own individual personalities. While Dadi Maa influences Vihaan in terms of having a mature point of view while tackling the problems of life, Narmada Maa, his biological mother, is his emotional anchor and coaches him on being sensitive to others. BuaMaa inculcates in him an intrinsic strength and the ability to stand up for what is right. ChachiMaa takes care of his diet and ensures he's eating right at all times. Mini Maa, being the fitness enthusiast she is, looks into his health and well-being. Tai Maa is his spiritual anchor, teaching him to stay connected with God and MaasiMaa is his intellectual guide who ensures that he excels in his career. How will his wife Aarushi, who hails from a nuclear family of modest means, where she is the sole bread winner, adapt to a joint family with seven mother figures? Only time will tell! One of the most challenging aspects of the show was to arrive at its casting as each of these mother figures called for actors of a certain caliber and maturity to portray the nuances effortlessly. The ensemble star cast includes some of the most iconic faces of Indian television. Veteran actor Farida Jalal returns to the small screen as Vihaan's grandmother who binds them all together!Powerhouse performers like BhavanaBalsaver, SadiaSiddiqui, ReshamTipnis, Sheetal Thakkar, Sonali Sachdev and SamtaSagar have stepped in to play the other mothers. Satrangi Sasural has Ravish Desai as the male lead protagonist – Vihaan, opposite MugdhaChaphekarwho essays the role of Aarushi. The show is produced by 24 Frames spearheaded by Purnendu Shekhar, NanditaMehra, GajraKottary and BhairaviRaichura. Sonali Sachdev, known to opt for meaty & performance-driven roles in theatre, films and television, will be seen playing a doting mother in the show. She shares her experience that she play Vihaan's biological mother who is a calm, balanced woman who does not talk much but is a strong individual & has a mind of her own. Even though her husband has left her without telling her, she is not bitter about life. Instead she's raised Vihaan instilling in him, strong values to make him a loving, kind & compassionate human being. The concept of seven mothers-in-law seemed interesting and different from the average, run-of-the-mill fare one typically samples. That is what compelled me to opt for the role. To work with creative minds like BhairaviRaichura and PurnenduShekhar is a privilege. Having impressed the audience and critics alike with her power-packed performances, Sadiya will be seen yet again in an author-backed role. She said, that she is playing the character of the elder bua – Vihaan's father's elder sister and daughter of Dadima (Farida Jalal). She has been through a traumatic marriage. Despite the bad experience, she has bounced back with determination & renewed vigor. She completely dotes on Vihaan. The manner in which Vihaan connects with each of his seven mothers is depicted beautifully and will tug at the heartstrings of the viewers. With the mother-in-law defining the character of any sasuraal and shaping the contours of a bride's everyday life, how will Arushi manage the challenge of making seven promises not only to Vihaan, but one to each of his seven mother figures as well.